Licener – Single Treatment is an easy-to-use head lice shampoo that eliminates head lice and their eggs in just one single application! Originally, the neem (Azadirachta indica) comes from India, Pakistan and Burma. 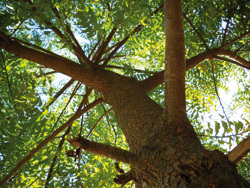 The neem tree grows in tropical and subtropical climates. Humans have spread the tree over Asia, Africa, America, Australia and the Pacific Islands. Mainly you see them in the shallow and arid areas of the tropics and subtropics. The neem very rarely occurs in mountain areas.